Social media holds major potential for sales enablement, but new research from employee advocacy platform Bambu by Sprout Social finds it’s a largely untapped channel for customer engagement by businesses today. According to Bambu’s new report, Shifting the Buyer’s Journey: How to Optimize for Social Selling, only one in four consumers say a sales representative has reached out to them via social—yet nearly 40 percent prefer social above all other avenues. Millennials are particularly keen on social media as an avenue for learning about new products and services. This generation is 45 percent more likely to prefer sales outreach via social than older generations. Social media perhaps has more potential with millennials because of their preference to see personality from a salesperson. The study found that nearly a quarter of millennials, compared to 12 percent of other generations, say they’re more likely to buy from a sales representative who shows their personality or non-work interests on social. The vast majority of respondents reported displeasure toward cold calling. 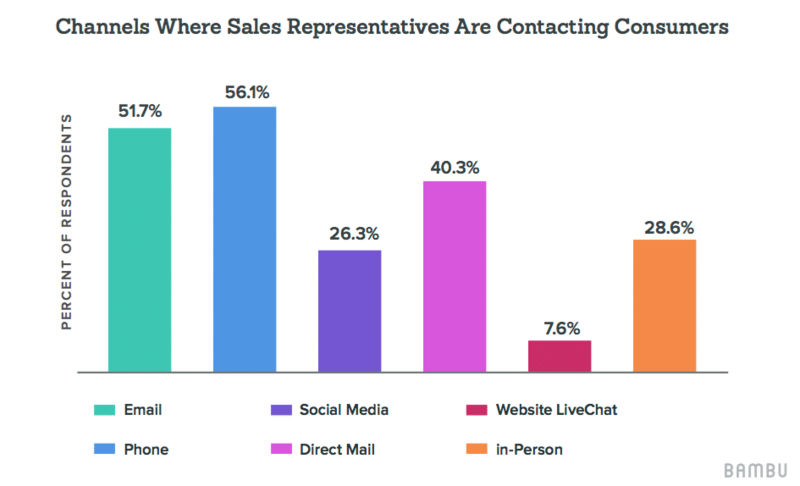 In fact, less than 9 percent said it’s their preferred channel to hear from a company for the first time, despite the fact that 56 percent of people said they’ve heard from a sales rep via the phone. Nearly forty percent of people prefer to hear about a new product or service through social media. Thirty-five percent of people are more likely to buy from a sales representative who shares industry news and helpful content on social. Almost a quarter of people (22 percent) say that a sales rep sharing helpful content on social makes them more likely to follow that representative on social. Forty-three percent of people are more likely to buy from someone who responds to questions on social. This survey was conducted by Survata, an independent research firm in San Francisco. Survata interviewed 1001 online respondents between August 18, 2017 and August 21, 2017. Respondents were reached across the Survata publisher network, where they take a survey to unlock premium content, like articles and ebooks. Respondents received no cash compensation for their participation.